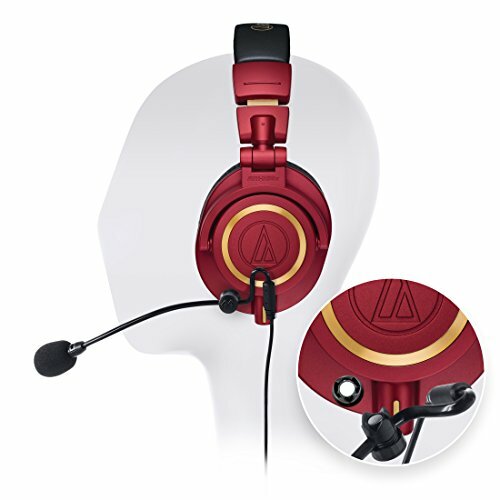 The Audio-Technica ATH-M50xRD Professional Studio Headphones (Red) exceptional sound quality and premium comfort. Equipped with Neodymium Magnets and Copper-Clad Aluminum Wire Voice Coil, the ATH-M50xRD delivers deep, accurate bass response. Additional Blucoil Headphone-and-Microphone Splitter with 4-pole gold-plated connectors to complete your bundle! HIGH-QUALITY SOUNDS - The Audio-Technica ATH-M50xRD headphones feature 45mm large-aperture drivers with Neodymium Magnets and Copper-Clad Aluminum Wire Voice Coil providing exceptional clarity throughout an extended frequency range. Its deep, accurate bass response is a must-have for audiophiles. SOUND ISOLATING HEADPHONES - The 90° swiveling earcups provide easy, one-ear monitoring, while the circumaural design offers exceptional noise isolation with minimal bleed. ANTLION MODMIC 4 - This uni-directional boom microphone reduces the noise coming from other sources in the room. It only allows the sound coming from one direction. The mic also features an in-line mute, perfect when you just want to listen to ATH-M50xRD headphones. The modular 3.5mm cable system and flexible steel spine are fully adjustable. FLEXIBLE - You can use the headphones DJ monitoring or personal listening. The boom microphone is also perfect for VOIP, recording, and gaming.